[ Blandford Fletcher and Stanhope Forbes, Newlyn School artists. ] Autograph Letter Signed ('Blandford Fletcher') from Fletcher to Forbes, on the occasion of his father's death, discussing the low state of his fortunes and health. The Mill, Steventon, Berkshire. 9 December 1888. 4pp., 12mo. Bifolium. In good condition, lightly aged. A splendid long letter in a close hand, revealing and informative, written a year after Fletcher had completed his masterpiece 'Evicted', painted at Steventon, and the first painting acquired by Queensland Art Gallery in 1895. Addressed to 'My dear Forbes', the letter begins: 'Your letter reached me yesterday having been sent on from home to the above address | Yes! Indeed you have my deepest sympathy. Manuscript 'Writing of Award indented', signed by 'John Whishaw & ffletcher Gyles Arbitrators' in a dispute between Joseph Fisher and 'Mark Jinks otherwise Jenks [...] Administrator of Samuel Mascie'. [ London. ] 10 August 1741. On one side of a 42 x 33 cm. piece of watermarked laid paper. In good condition, lightly aged and worn, with Gyles's seal torn away from the bottom right-hand corner. Signatories' names at bottom right: 'J: Whishaw [seal in red wax] | F Gyles'. Witnesses' names at bottom left: 'Rob: Wadeson | Jno. Jackson Cursitor's Street'. Three embossed tax stamps to left-hand margin. Headed: 'All Matters adjusted to Midsummer 1735 inclusive', followed by two columns of accounts, that on the left headed 'Mr. ffisher hath paid Since that time to wit', and that on the right headed 'Mr. 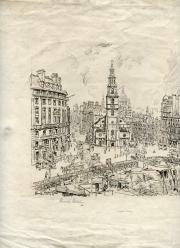 Pamphlet by 'Royal Naval Artillery Volunteers, London Brigade, Head Quarters, H.M.S. Frolic, off Somerset House, W.C December 1891.' Printed by Woodfall & Kinder, London. 'Progress Return', 1890.. Printed by W. Collins, Harlesden. The two items from the papers of Sir Richard Harington of Ridlington, 12th Baronet, who features as 'R. Harrington [sic]' in the 'Progress Return'. The pamphlet is 6pp., 12mo. The front page is headed, with crown-and-anchor device, 'Royal Naval Artillery Volunteers. | London Brigade. | Head Quarters, | H.M.S. Frolic, off Somerset House, W.C | December, 1891.' Printed by Woodfall & Kinder, Printers, 70 to 76, Long Acre, London, W.C.' Aged and grubby. Folded into a packet and addressed, with postmarked Halfpenny Red stamp, to 'R. [William W. Clary, Los Angeles book collector.] Typed Letter Signed ('William W Clary') to the wife of London theatrical bookseller Ifan Kyrle Fletcher, regarding 'autographed letters', the publication of a Max Beerbohm item, and the Zamorano Club. 433 South Sprint Street, Los Angeles 5, California. 8 May 1961. 1p., 8vo. Air mail letter addressed to Fletcher at 22 Buckingham Gate, London SW1. In good condition, lightly aged and worn. He thanks him for his letter 'regarding autographed [sic] letters', explaining that 'we have gone in very little for letters and manuscripts, although we have made a few exceptions where they were in bound volumes or had some very important Oxford interest'. (Clary's Oxford collection is now at the Claremont Colleges Library. Williams's letters do not 'quite fit our program' (the plural presumably referring to Claremont). Hand-coloured lithographic prints. Nine panels, each roughly 10 x 18cm, attached to make one accordion-folded strip. In fair condition, aged and worn, with three blank panels inserted in the strip to fill up gaps. Captions along the foot read: '12 Members of the Common Council in their Mazarine Gowns', 'The Sheriffs', 'Aldermens Carriages', 'The Queen's Household', 'Royal Footmen', 'Life Guards Police Officers'. The last panel shows the head of the procession arriving at the new building. The set of prints was sold by the publishers in a blue cloth folder, with title leaf. [Printed item.] Past Students of the Cambridge University Training College for Schoolmasters, with the Schools in which they are now serving. [Cambridge University Training College for Schoolmasters.] Warkworth House, Cambridge, March, 1912. 4pp., 4to. Bifolium. In fair condition, on aged paper with slight wear to extremities. Shelfmarks, stamp and label of the Board of Education Reference Library, London. A chronological list, in small type, covering the period 1898 to 1911. Divided into five columns: Name of Student; College; Year of leaving College; Degree; Present School. Scarce: no copy traced on COPAC or OCLC WorldCat. [Printed pamphlet.] Irish Technical Instruction Association. Adult Education in Town and Country Problems of To-day. Athlone: Printed by the Athlone Printing Works Co., Ltd. 1924. 11pp., 12mo. In grey printed wraps. In good condition, on aged paper, with rusted staples. Shelfmarks, stamp and label of the Board of Education Reference Library, London. Subtitled on p.1: 'A Paper read on June 4th, 1924, at the Annual Congress in the Mansion House, Dublin, the Revd. Professor Finlay, M.A., S.J., presiding, and reprinted by the Association by desire of the Congress.' Scarce. [Printed pamphlet.] Association of Technical Institutions. Report of Proceedings at the Belfast Summer Meeting, July 12th and 13th, 1907, Including Papers [...] By Mr. G. Fletcher, [...] And [...] By Principal Forth. 42pp., 12mo. In light-green printed wraps. In good condition, on lightly-aged paper, with rusted staples. Shelfmarks, stamp and label of the Board of Education Reference Library, London. The second part of the title reads, in full: 'Including Papers on The Organisation and Position of Technical Education in Ireland, By Mr. G. Fletcher, Assistant Secretary for Technical Instruction in Ireland; andn on The Evolution of the Technical Instruction Scheme in Belfast, By Principal Forth.' Scarce. [Ralph Straus.] 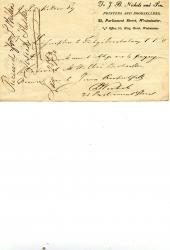 Typed Letter Signed to the theatrical historian and bookseller Ifan Kyrle Fletcher, discussing, with biographical information, playbills associated with George Augustus Sala he requires. With Typed Note Signed and Typed Card Signed. 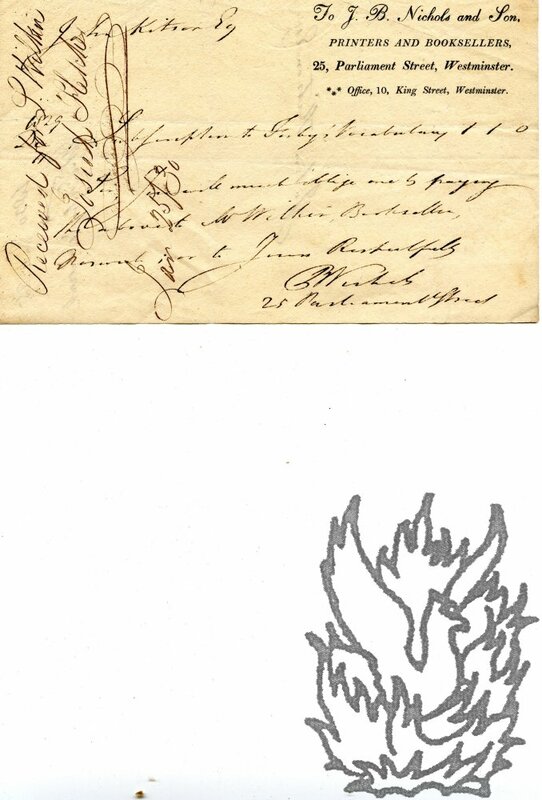 The letter and note both on letterheads of Ralph Straus, The Tanyard, Shorne, Nr. Gravesend; 6 January 1939 and 8 January 1945. The card from the Tanyard; 7 January 1945. All three items in good condition, on lightly-aged paper. All signed 'Ralph Straus'. ONE: TLS. 6 January 1939. 1p., 8vo. After expressing his willingness to have 'the programme of Wat Tyler and the Bil of Madame Sala for 1827', he expresses his desire to acquire playbills 'of Sala's grandfather, in a King's Theatre ballet 1776 onwards - particularly if it gives his Christian name of Claudio. I know of one in Jan. 1788. The material is loosely inserted in a copy of 'Passionate Nomad. The Life of Freya Stark' by Jane Fletcher Geniesse (New York: Random House, 1999). xxvi + 402 + pp., 8vo. Very good, in like price-clipped dustwrapper, and inscribed to Drower by her daughter. Drower is described on p.296 as 'daughter of Freya's old Baghdad friend Lady Drower, [who] followed Pam Hore-Ruthven as her assistant and spent two years trying to get repaid for the cost, not to mention the enormous effort, of packing up Freya's belongings and sending them to Asolo after the war'. Three pages, cr. 8vo, fold mark, dusted and grubby, but text clear and complete. 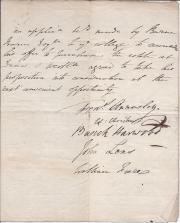 [Meeting] "Present | Dr Annesley Master | Professor Christian | Harwood | Mr Lens | Frere Fellows | It being notified that ye fellowship of Mr Meek had become vacant by marriage before their meeting it was agreed to declare the sd fellowship vacant & that an election to supply the same shod. take place on Easter Monday ... in conformance to the charter. | And the Master was requested to arrange the mode of examination & election ... | On further consideration of the ... the buildings sho[ul]d.
Two Autograph Letters Signed to Osbert Burdett, both on the subject of his study of the novels of the Dutch writer 'Maarten Maartens'. 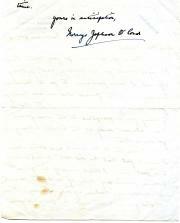 18 and 21 November 1930; both on letterheads of 31 Edwardes Square, Kensington, W8. Both letters 4to, 2 pp. Both texts clear and complete, and both in fair condition, with dog-eared corners. In the first letter O'Conor writes that he has 'heard from Miss Maartens', and that he is sending 'Dr van Maanen's' study of the author. 'Miss Maartens suggests that you and I might meet, which appeals greatly to me, for I enjoyed your review of the Maarten Maartens letters and have also heard about you from my friend John Gould Fletcher.' Gives a time when 'Miss Maartens is coming to the London Library to read some Dutch' for him, and he suggests that Burdett join them. Typed Letter Signed by Fletcher to Flower; the Typed and Signed ('Desmond Flower') reply; Two Typescript drafts and an offprint of the paper 'The Literature of Splendid Occasions in English History'; typescript of another paper on splendid occasions. Fletcher's letter, 15 March 1947, letterhead of 12 Lansdowne Road, Wimbledon; Flower's reply, 18 March 1947, on Cassell & Co. letterhead; two drafts of first talk, 1947; offprint, London: The Bibliographical Society, 1947; draft of second talk, 1953. The collection is in very good condition. 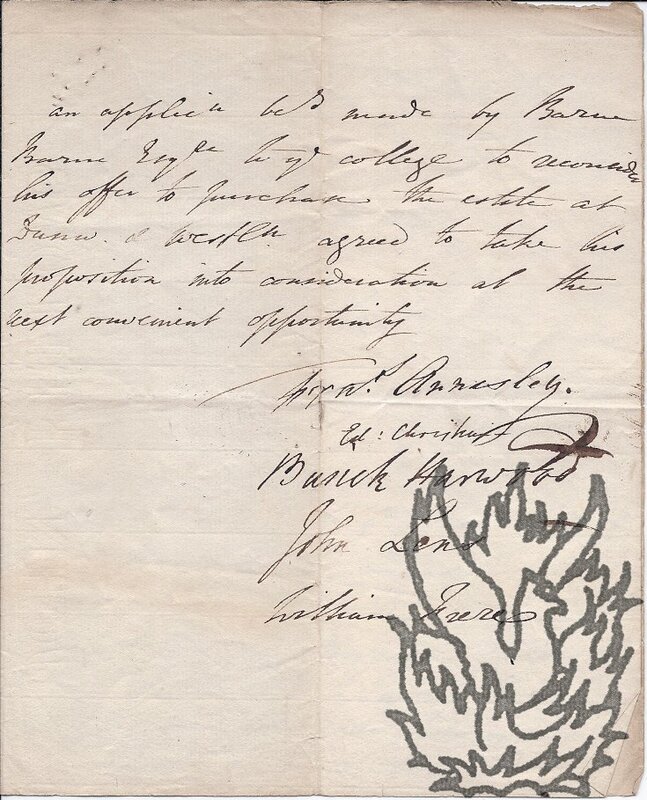 Fletcher's letter (12mo, 2 pp) contains several autograph corrections, and its presence with Flower's reply suggests that, although signed, it may be a draft. Fletcher was pleased to see Flower at the Bib. Soc. meeting. 'Since then I have been turning over in my mind a project which may interest you.' His paper is 'based on material I have gathered for a bibliography of English splendid occasions', which is 'nearly ready and I hope to issue it, by private subscription, later this year'. Printed in brown on a piece of watermarked laid paper, 29 x 36 cm. Dimensions of image 18 x 22 cm. On lightly-creased paper, with a few short closed tears to margins at extremities. A bustling scene, from the top storey of a building, showing the traffic of coaches, carriages and carts around the church, which is seen from the front with St Paul's Cathedral in the background. 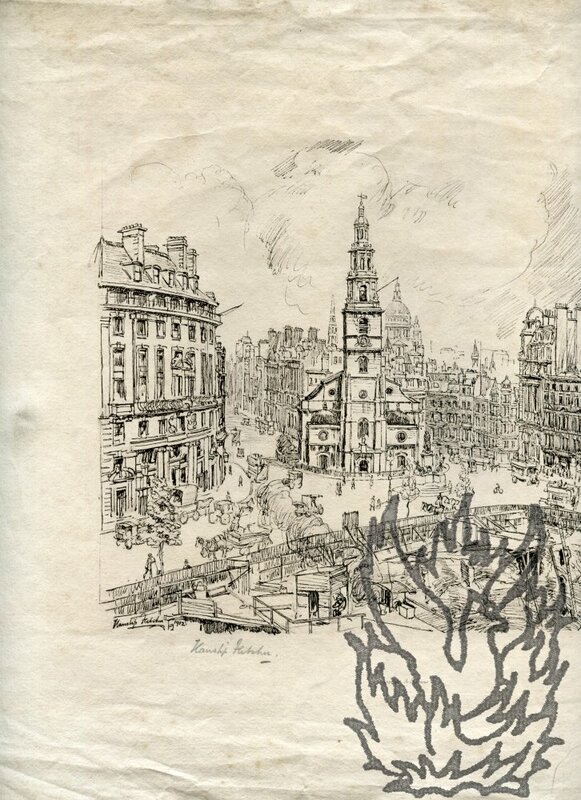 In addition to the pencil signature, the print has the dated facsimile signature 'Hanslip Fletcher 1912'. Receipt, signed 'B Nichols, 25 Parliament Street', for a guinea subscription to Forby's 'Vocabulary'. Countersigned by Fletcher. 11 December 1829. On printed company letterhead. On one side of a piece of wove paper roughly 10.5 x 17.5 cm. Good. Printed in top left-hand corner: 'To J. B. Nichols and Son. Printers and Booksellers. 25, Parliament Street, Westminster. ***Office, 10, King Street, Westminster.' Asks that the 'Subscription to Forby's Vocabulary 1 1 0' be paid to him or to 'Mr Wilkin, Bookseller, herewith'. Countsigned crosswise 'Received for S. Wilkin | [signed] Josiah Fletcher | Jan 25/30'. Docketed on reverse. BBTI has Wilkin as a bookseller in Norwich from before 1821 to 1830; and Fletcher as a binder and printer there from around 1820 to 1835. 3 ALsS, 1 ANS and 1 ACS (all 'Robert Speaight') to Kyrle Fletcher. 12 September to 16 December 1951; variously from the Garrick Club; Campion House, Benenden, Kent; and 44 Onslow Gardens, London. The collection is in good condition, with items on lightly aged and creased paper. 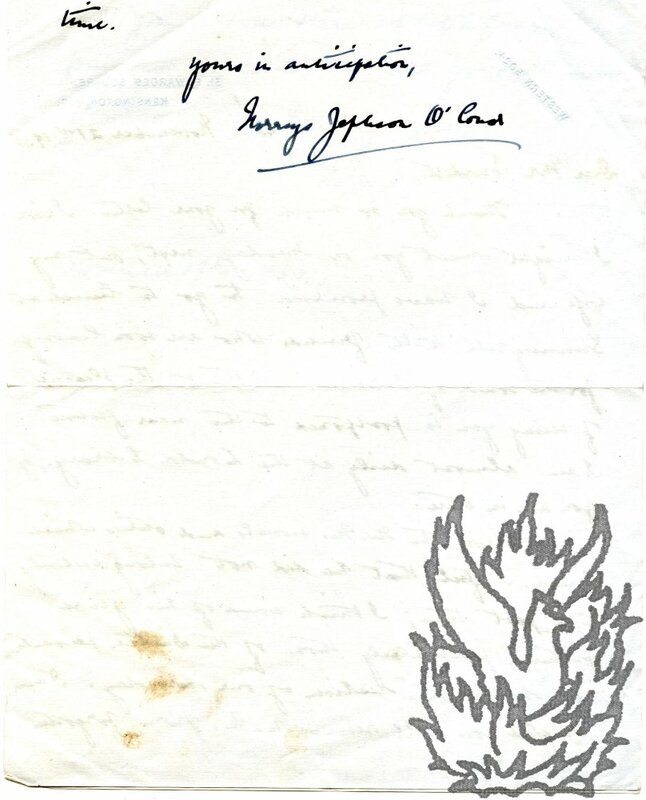 Letter One (12 September 1951, Onslow Gardens; 12mo, 1 p, in envelope): As Kyrle Fletcher 'may have seen', Speaight is engaged in a biography of William Poel, and is 'anxious to trace the letters he received from Shaw & which were sold about 1930'. Kyrle Fletcher has docketed the envelope with a precis of his reply. Card (postmarked 14 September 1951): Thanking Kyrle Fletcher for his 'letter & most useful suggestions'.